The ancient Kingdom of Fife (County of Fife) on the East Coast of Scotland, sandwiched between the Forth estuary in the South and the Tay estuary in the North, has a distinct identity befitting an area long cut off from the cities of Edinburgh and Dundee until the building of the famous Forth Rail Bridge and the once infamous Tay Rail Bridge (happily replaced by a sturdy but elegant bridge - one of the longest in the world). In recent times both estuaries are traversed by toll free road bridges. Although the north and south parts of Fife are quite different, attractions for visitors are available throughout. See suggestions below. Situated in North Queensferry, Scotland's National Aquarium boasts the longest underwater tunnel in the UK. Essential minerals from natural Scottish seawater from the Firth of Forth are nourishment for the animals in the displays. Visitors move through themed zones getting up close to one of the largest collections of predator sharks in Europe - safely enclosed, of course! You are then taken on an Underwater Safari around the world. A great day out for adults and children alike - and you can return time and time again as the exhibits are regularly changed. Fancy a shark dive to meet Sand Tiger Sharks, Angel sharks, Stingrays and Tope? - then purchase evouchers online. Free car parking. Open all year. Near the market town of Cupar is the Scottish Deer Centre where there are daily tours and feeding events. Rangers introduce you to deer species from around the world You learn about raptors, otters, wolves, red fox and wild cats and conservation efforts for rare and endangered species. There is an indoor play area in the advent of poor weather, a tree top walk and woodland walks. If that is all too much to take in there is respite in the shop for shopaholics and a lovely tearoom to put your feet up. Bizarrely the location of The Secret Bunker is sign posted from most places in Fife and as it is near St. Andrews it is easy to find. It's been known to the public when it was revealed in 1994, 40 years after being hidden underneath a farmhouse. You enter this nuclear bunker through a 450 foot (approx.135 metres) long tunnel to reach 100 feet (approx 30 metres) underground, feeling the heat increase as you go. 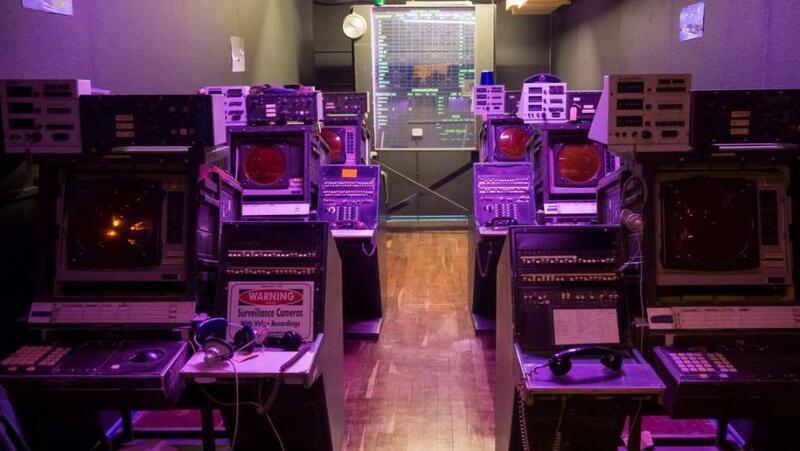 The bunker was built to help safeguard Scotland during the Cold War - a place where government officials could advise our citizens of what to do in the event of a nuclear attack. It all seems so naïve nowadays, but at the time a lot of thought had gone into it. The exhibits are fascinating and as there are two large floors there is much technology to be seen. The café food duplicates what was probably available to the operators at the time! Just two miles from the centre of St. Andrews lies Craigtoun Park, a beautiful estate with a putting green, a bowling green, a walled garden, Cypress avenue, Italian garden, rose garden and mature trees and shrubs. For children there are boats, crazy golf, a miniature railway, bouncy castle, nature trail, adventure playground, and picnic areas. Mute swans, mallards, grey herons, red squirrels and European water voles can be seen around the numerous small lakes.